It’s all going to kick off today at Sound City but where to go first? What to value over the clashes? Here are some of our favourite acts of the day and where to find them. There is a storm brewing in the name of Jordan Allen. The four-man band consisting of frontman Jordan, lead guitarist Danny, bassist Kieran and drummer Nathan. Their track “110 Ways to Make Things Better” was voted number one anthem of Virgin Radio’s Freshfest in 2017 and they’re soon to be playing Bingley Music Live with headliners Noel Gallagher’s High Flying Birds and Jake Bugg. It is obvious that Jordan Allen are becoming a name on our tongues we always are fiending to taste more of. With influences such as David Bowie, Lou Reed and Arctic Monkeys – Jordan Allen come with lyrical supremacy laced with fierce hooks and electricity. The boys toured with The Sherlocks last year then headlined their own tour with copious sold out events with the likes of Sheafs and The Elephant Trees. Their sound is infectious, highly contagious and they are coming to Liverpool to spread the hype! The lads will be at Constellations at 10pm so do not miss out on one of the most exciting bands of 2018. The Blinders, a three-piece band hailing from Doncaster. Their sound intertwines rock and roll with a staring contest only they can win. The band have landed from a time machine with a bible of hot tracks, sacred to the human ears and ready to take on the 21st century in a punk rock fashion. The band moved to Manchester following in footsteps of some of the biggest names in music. Their latest track ‘L ‘Etat C’est Moi’ referring to Louis XIV’s divine authority demonstrates an eloquent fury taking song writing to different level. The boys come equipped with lyrical weapons and full ammunition as they take to the District stage at 7:15pm. Local lads Jonny, Andy, Sean and Louis have stolen our phone memory, data usage and also our hearts. Their recent self-titled EP released this year gives us summer vibes with a The Smith’s on anti-depressants edge. SPINN’s dreamy guitar sound mixed with heartbreak melodies are enough to make you fall in love. 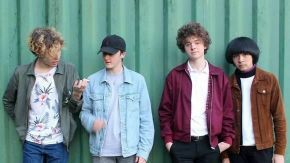 With tracks like ‘Who You Are’ and ‘Notice Me’ having over a million plays on Spotify, the boys are one of Liverpool’s most promising up and coming bands. They are playing at the District stage at 5:45pm to provide us with sunshine and good vibes into the evening. The headline act closing the Camp and Furnace stage at 9:30pm. The DMA’s are more in demand than tattoo appointments adding a star to Liverpool badges after releasing their new album For Now. Lead singer Tommy O’Dell, an Evertonian wrapped up in Burberry, poised with soothing vocals channelling laid back vibes regardless of the jet lag. Their new album is a combination of what it feels to like to wake up in the middle of night in a hot sweat and having a hot sweat in the middle of the night. DMA’s gained exposure on Triple J Like A Version covering Cher’s Believe and now are taking Liverpool by storm. DNA’s are going to leave their presence in Liverpool, natured and regarded along with other headline acts of Sound City such as Florence and The Machine and Ed Sheeran.